Sometimes you might want send email from one account (i.e. your personal account) but want any replies from your recipients to go to another account (i.e. your business account), vice versa. This is how you would do it on an instance by instance basis. From the Home tab of the top ribbon, click the New E-mailbutton. In the New E-mail window, click the Options tab. On the Options ribbon, click Direct Replies To to bring up the Properties dialog. You are done! Now send yourself a test message. When you receive the test message, hit reply to confirm it is showing the proper alternate Reply-To email address. 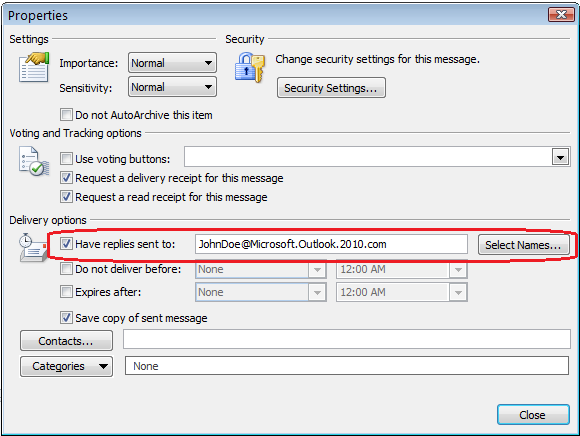 Now you know how to change the Reply-To Email Address on an instance by instance basis.